Thank you for breaking down your "process" for dating this postcard. Luv your eye for detail in researching the history of this item! Thanks for this walk into my husband's ancestral town, fM! His paternal grandmother, Helen Mary (WESTABY) MIDKIFF TUCKER, was born in Glendive in 1915. 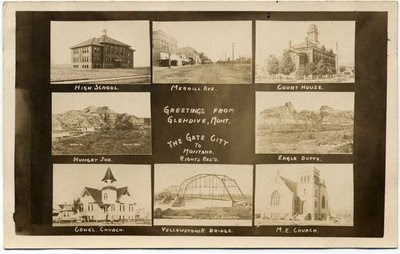 I probably have a few scans of Glendive postcards myself (borrowed and scanned from the collection of Helen's parents and now in the possession of my father-in-law), but unfortunately, they're not quickly accessible. My main computer is down, and the scans are either backed up to Carbonite or on my portable drive...either way their accessible, just not as quickly as I'd like. I'll take a looksee here soon. I really love to research! I try to write what I do in a logical progression so that it can be followed. Mr. Maven's mother was born in Intake. Your husband's grandmother was born around the time this postcard was probably produced. Any information you have would be greatly appreciated. I'd love to nail down a date, or at least narrow it a bit more. Sorry to hear your computer's down. Hope it's on the mend soon. Thank you so very much for your second contribution to the Festival of Postcards. 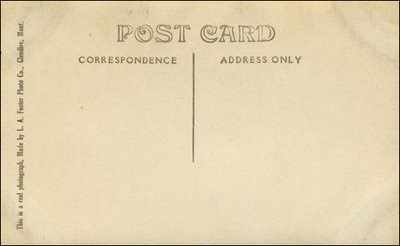 Once again you've added to our knowledge of postcards and I really appreciate the enormous effort you put into your articles.